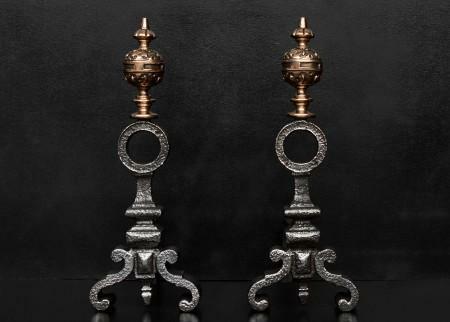 Although our range predominantly features reclaimed firedogs and andirons, with designs spanning the 18th and 19th centuries, we also carry a selection of high quality reproduction firedogs, featuring striking designs in polished steel and brass. All of our reclaimed firedogs can be modified to accept log cradles of varying sizes which we can also supply. Please don’t hesitate to contact us for more details. 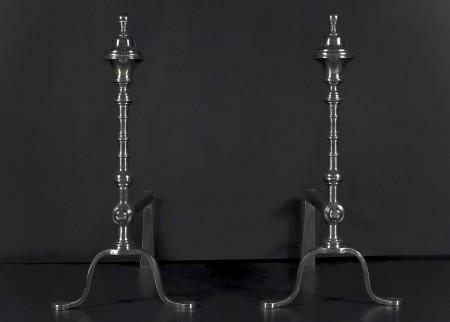 A pair of 19th century polished steel firedogs. 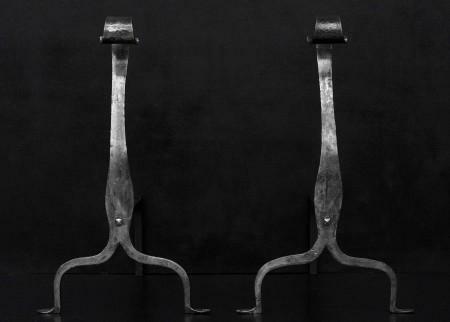 The shaped feet surmounted by tapering shaft with square finial to top. N.B. May be subject to an extended lead time, please enquire for more information. 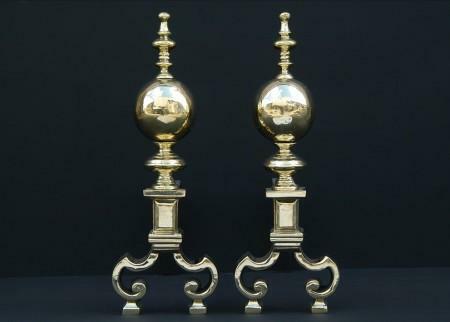 A pair of brass horseshoe firedogs. English. N.B. May be subject to an extended lead time, please enquire for more information. 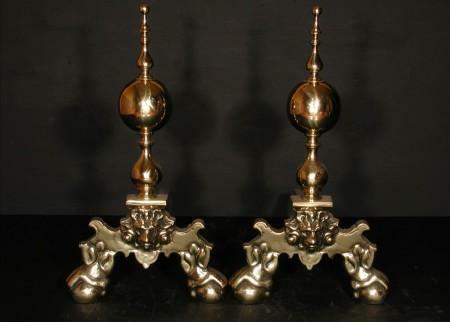 A pair of brass firedogs with balls to finials and break leg design to bases. N.B. May be subject to an extended lead time, please enquire for more information. 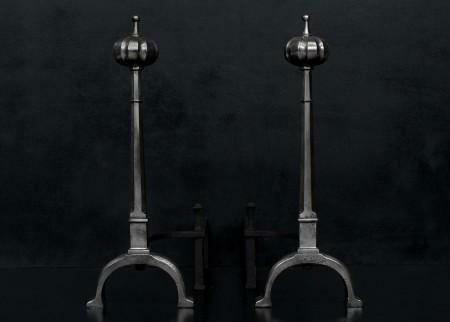 Pair of English steel firedogs, with ball and finial top and breakleg base. N.B. May be subject to an extended lead time, please enquire for more information. 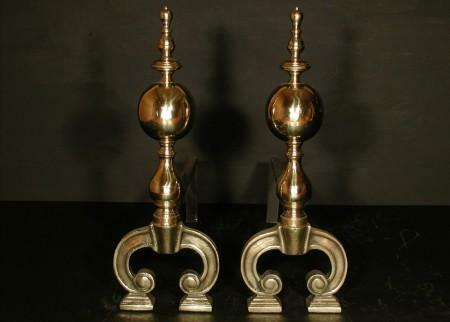 A pair of English polished brass firedogs with horseshoe shaped legs, baluster shaped finial, surmounted by domed and beaded top. Modern. N.B. May be subject to an extended lead time, please enquire for more information. 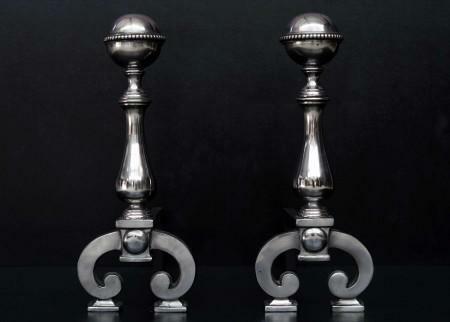 A pair of good quality elegant Georgian style English antiqued firedogs. 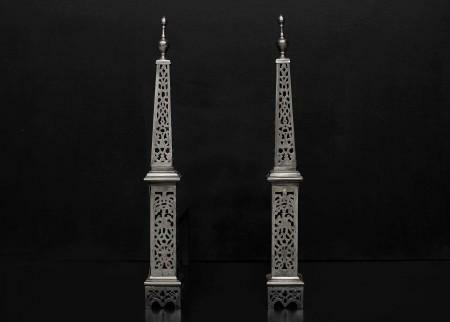 The turned uprights surmounted by urn finials. N.B. May be subject to an extended lead time, please enquire for more information. 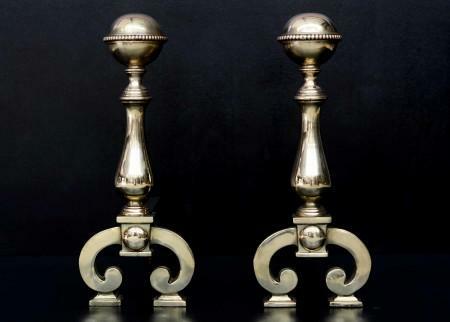 A pair of good quality elegant Georgian style English brass firedogs. 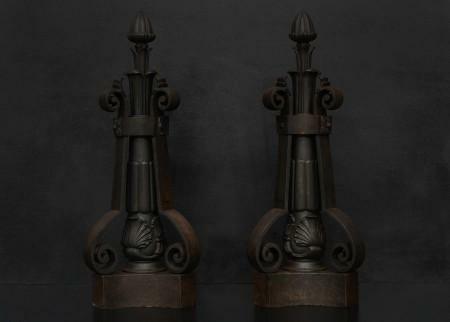 The turned uprights surmounted by urn finials. N.B. May be subject to an extended lead time, please enquire for more information. 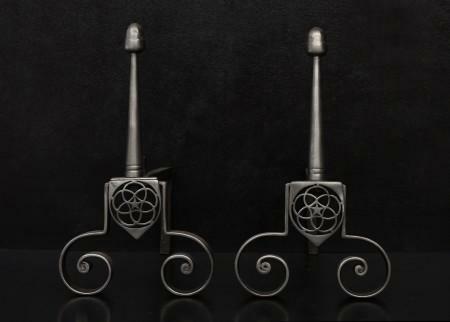 A pair of good quality elegant Georgian style English steel firedogs. 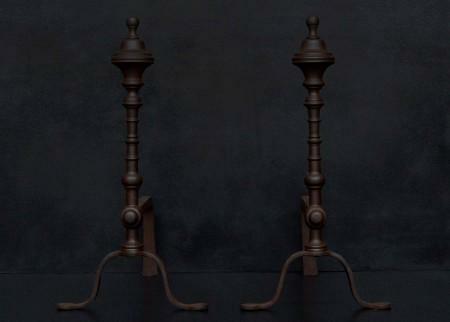 The turned uprights surmounted by urn finials. Pictured with polished back bar which could be blacked if required. N.B. May be subject to an extended lead time, please enquire for more information. 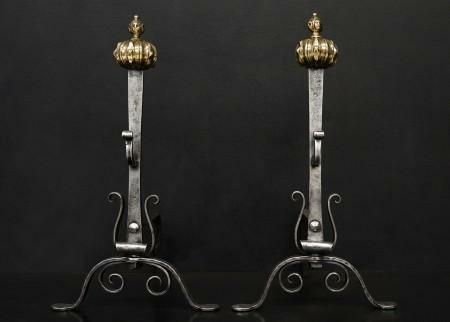 A pair of polished steel Arts and Crafts firedogs, with acorn finials, tapering shafts, star motif and scrolled legs. English. A substantial pair of English firedogs. 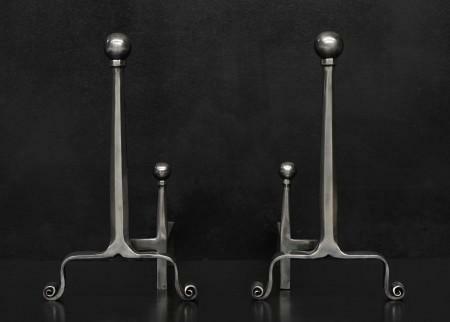 The scrolled tops with ring below, tapered shafts with scrolled feet below. Could be polished if required. A pair on polished steel firedogs. 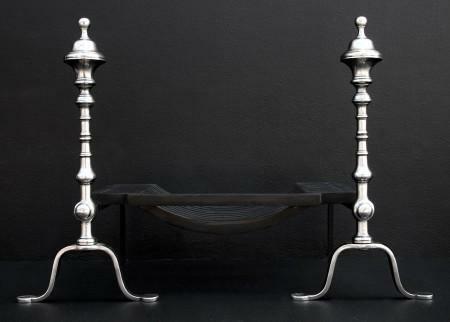 The shaped feet surmounted by tapered square shaft with barley twist and pyramid finials. English, circa 1900. 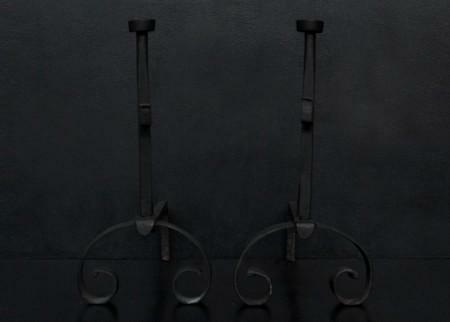 A set of wrought iron firedogs. 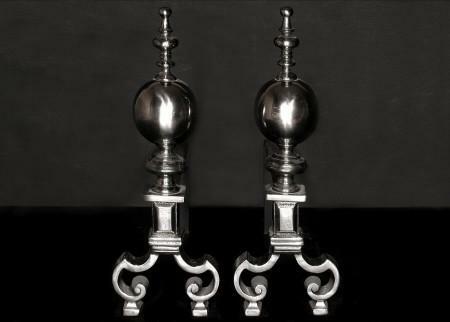 The arched feet surmounted by ring and button finial. Scrollwork throughout. English. 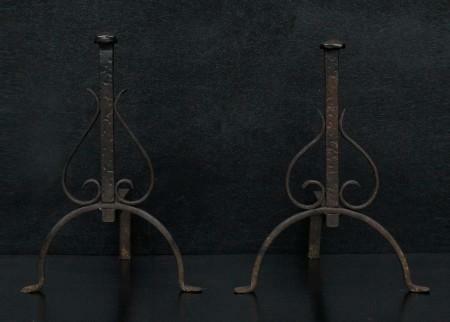 A pair of wrought iron firedogs with shaped feet and plain finial tops. English. Currently with antique brown wax, but could be polished if required for an additional cost. 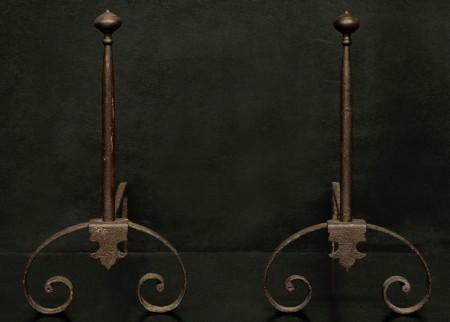 A pair of elegant wrought iron firedogs with scrolled feet, plain shafts and bell finials. English, 19th century. 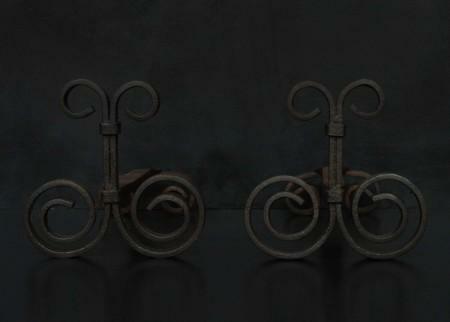 Currently with rustic patina, but could be polished if required for an additional cost if required. 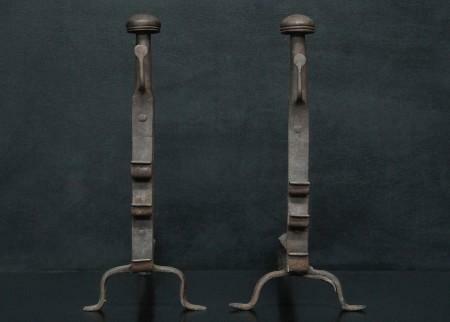 A pair of rustic cast iron firedogs with arched feet, tapering shafts and mulling top finials. English. Heavy and imposing. 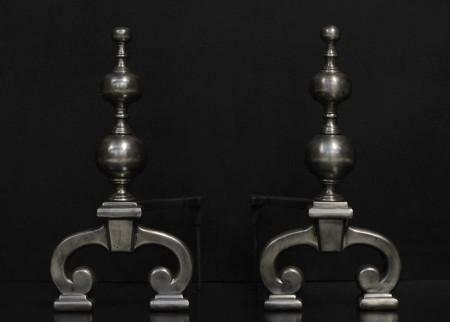 A pair of George III style steel firedogs in the manner of Thomas Chippendale. Pierced throughout with urn finials above. English, 19th century. Good quality. 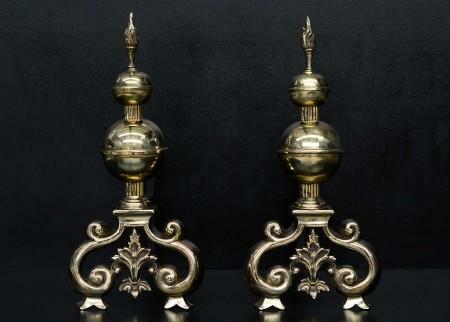 A pair of large Baroque style brass firedogs. 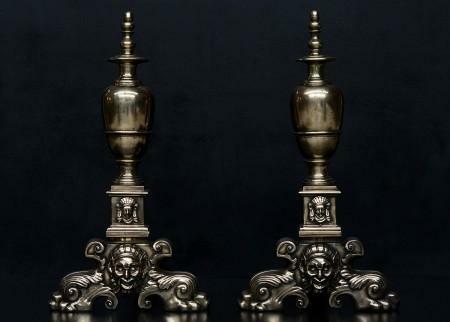 The cast brass splayed feet with foliage and mask to centre, surmounted by bulbous finials. English, 19th century. 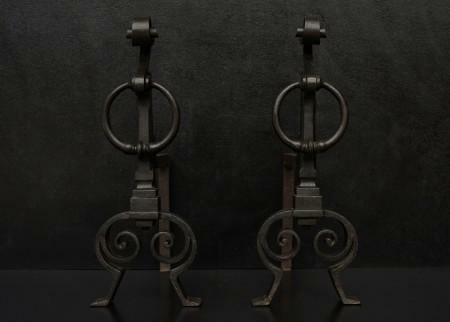 A pair of large polished wrought iron firedogs of sweeping shape with scrolled tops. English, 19th century. 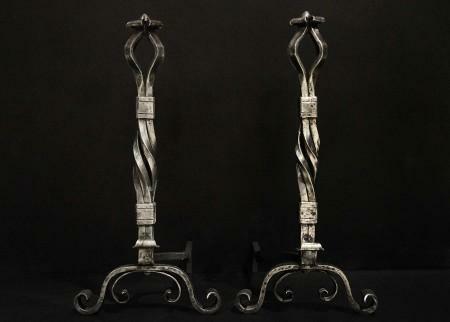 A fabulous pair of polished large wrought iron firedogs. 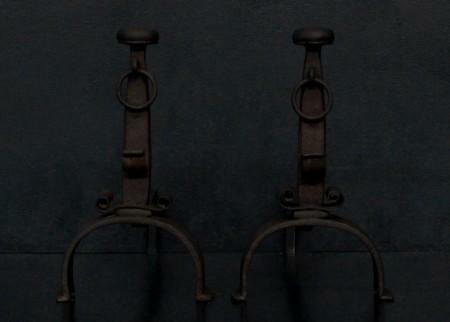 The scrolled feet surmounted by barley twist shafts and shaped tops. An impressive set with nice patina to iron. English, 19th century. 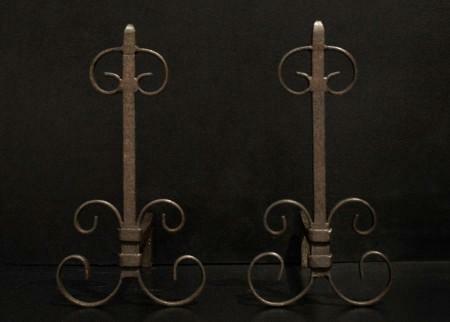 A pair of French wrought iron firedogs with scrolled detailing. French, circa 1900. With a waxed finished, could be polished if required. A pair of polished steel firedogs. 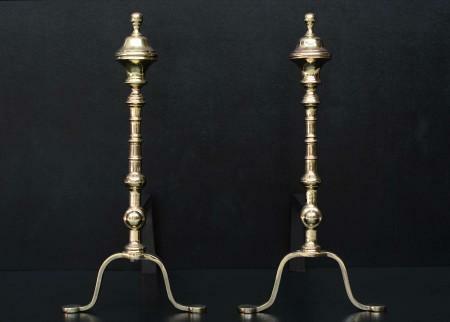 The scrolled feet surmounted by barley twist shafts and scroll work, with brass ball finials to top. French, 19th century. A pair of rustic firedogs. 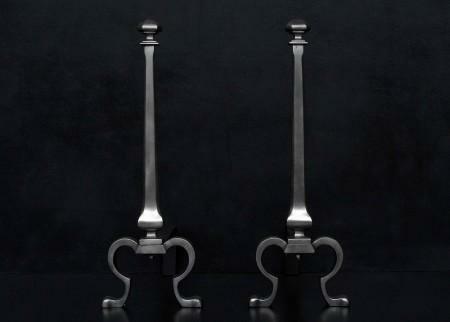 The scrolled feet surmounted by straight shafts and flat tops. Currently brown waxed, but could be polished if required. 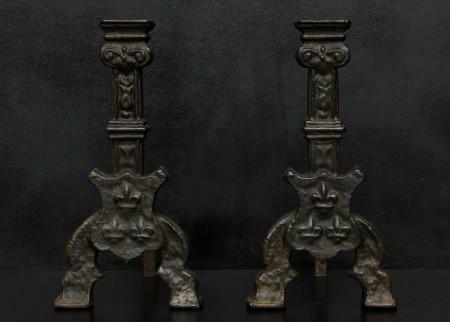 A pair of cast iron firedogs in the 16th century Jacobean style. 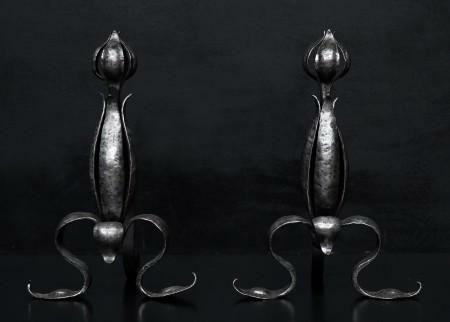 The uprights featuring shields with fleur-de-lys and finial above. English, 20th century. 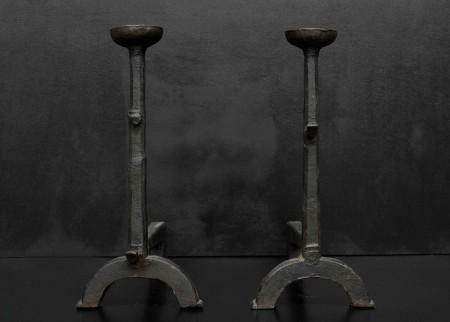 From the Gomme’s Forge in Buckinghamshire. A pair of large brass firedogs. The shaped feet with foliage to centre surmounted by globes to shafts and flame finials. English, late 19th century. 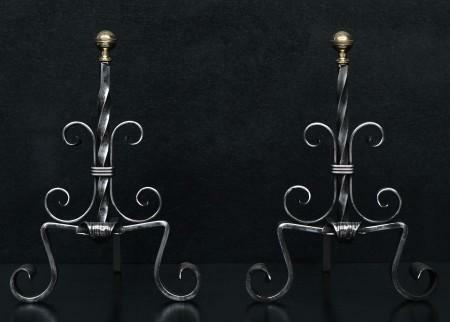 A pair of Baroque style firedogs. The cast iron body with circular detail to centre, surmounted by bronze finials with sphere of spherical form. English, second half of 19th century. 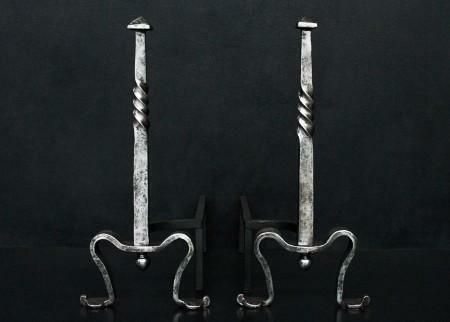 A pair of steel firedogs with scrolled feet and ball finials. English, modern.